The son of a wife wedded according to the Brahma rite, if he performs meritorious acts, liberates from sin ten ancestors, ten descendants and himself as the twenty-first. (Manusmriti 3:37). Hindus loves their children dearly. They believe that their children are gifts from gods and products of their previous karma. Many presume that their children were related to them in their past lives or were their close friends. According to Manu, a man recreates himself through his own children. Since a Hindu firmly believes in rebirth, he views his own life from a wider perspective that encompasses not just this life but many other lives that preceded it as well as succeed it, and his individual existence as a part of a great cosmic cycle. Endowed with the belief that his relationships repeat themselves and that his life is intricately intertwined with many others who share the same destiny, he acts with a greater sense of duty and responsibility towards himself and all those who depend upon him and are related to him. Since he sincerely believes in the continuity of his life and relationships, he works for the welfare of his family and their financial security through a policy of self denial and austerity in personal expenditure. Orthodox Hindus do not approve childlessness and consider it to be very inauspicious. Women without children have to face social discomfort and questioning looks from friends and relations. Newly married couple have to deal with peer pressure if they fail to produce children within a reasonable time after their marriage. Childlessness causes great hardship for both men and women in Hindu families, despite the fact that over population is a major problem of present day India. While for men it is mostly a problem of their virility and manhood for women it is the stigma of barrenness and the absence of the pleasures of motherhood. Barren women are not allowed to participate in certain rituals and on some occasions their very presence is considered inauspicious, which add to the stigma of infertility. A son is generally preferred because he upholds the family values and ensures its continuity. The Vedas clearly state that a man lives through his son. Before passing away, a father well-versed in the Vedas transmits his qualities and powers to his eldest son performing a special transmission ceremony, which gives the son the right to head the family and continue the family tradition in the footsteps of his father and ancestors. Hence, the birth of a son in the family is crucial for the lineage to continue. The Vedic people performed different rituals to obtain different types of sons. The Brihadaranyaka Upanishad (6.4) suggests what procedures couples should follow to obtain a son of fair complexion, or brown complexion, or dark complexion with specific knowledge of the Vedas and lifespan. According to Gautama Sutras (28:18), if a person does not having male children, he may ask his daughter to raise a son for him. A family without a male child is considered accursed. Male children are preferred for many reasons. Financially a male child is an asset. Socially he stands for the continuity and the exalted image of the family. Spiritually he helps his parents in their afterlife, by performing their funeral rites when they die and saving them from the hell of Punnama where people without sons are believed to go. Thereafter he performs the shradda ceremonies at regular intervals to ensure their well being in the heavens. The female children are excluded from participating in funeral ceremonies and are not even allowed to visit the cremation grounds. If a couple has more than one son, the elder one and the younger one would lit the funeral pyres of their father and mother respectively. Hindu law books do not ignore the rights of illegitimate children. According to Gautama Sutras (28:33-34) the son of an unmarried damsel, the son of a pregnant bride, the son of a twice-married woman, the son of an appointed daughter, a son self-given, and a son bought belong to the family of their fathers. In the absence of a legitimate son or other heirs, they receive a fourth of the estate. The law books also laid down elaborate rules of inheritance for children born out of inter-caste marriages and polygamy. In many families girl children are subjected to gender bias. Having too many girls in a family is considered a great financial burden since the parents have to pay large dowries for their marriages. The girls have no right of inheritance. The ancestral property of the family invariably goes to the male children. Parents have the right to distribute their own wealth (swarjitam) to their daughters. But generally they do not do so unless they do not have male children. After marriage a girl child becomes the sole property of her husband and cannot stay with her parents however strong might have been their relationship. While the birth of a son is still welcome in almost every Hindu family, now a days the birth of baby girl is also welcomed by many educated parents, who consider it as an auspicious sign, as if a goddess is born in their house. Hindus are very possessive about their children and spend a great deal of their time and energy in bringing them up. Because of orthodox sentiments and moral values, the parents are always concerned about their children's welfare and upbringing and expect them not to bring a bad name to themselves or to their families. Compared to the western societies, the Hindus are sentimentally and emotionally more attached to their children and experience a greater warmth and intimacy in their relationships. The bond between the parents and children remains intact even after the children grow up and get married. In a Hindu family it is an obligatory religious duty of the sons to look after their aged parents and provide them with decent means of living. Many do so. But like in other societies, aged people are increasingly suffering from problems of alienation, isolation and their children's indifference and neglect. Old age homes which were non existent a few decades ago are now coming up in many parts of India. 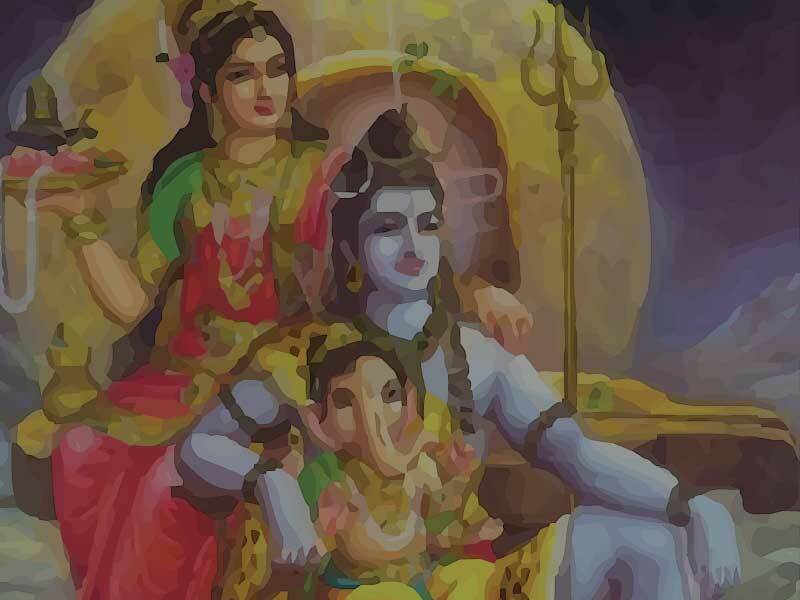 Hindu family system is undergoing radical transformation. But a great majority of Hindu families still consider their children as products of their past deeds (purvajanma sukrutam). If a child strays and brings bad name they blame it upon themselves and their previous karma. 1. Rites performed before the birth of an individual, invoking gods to make a woman of the household conceive. 3. Rites performed at the time of the birth of a child. 4. Rites performed at the time of name giving ceremony. 5. Rites performed six months after the birth of the child. 6. The hair cutting ceremony. 7. Rites performed at the time of "upanayana" to make the individual a "dvija" or twice born". Apart from caste and birth, both parents and children can be classified in three types based on the predominance of their gunas: sattvic, rajasic and tamasic. As the gunas imply, sattvic parents and children show preference for devotional services, spirituality, religious activity, virtue knowledge and wisdom. Rajasic parents and children show preference for material goals selfish actions, worldly knowledge and display of strong emotions. Tamasic parents and children show preference for cruel, painful and demonic actions, wrong knowledge and dark passions. They are difficult to discipline as they show least respect for tradition, society or human values.